Ewen James Andrew McKenzie is an Australian professional rugby union coach and a former international rugby player. He played for Australia’s World Cup winning team in 1991 and earned 51 caps for the Wallabies during his test career. The Queensland Reds had immediate success following Ewan’s appointment in 2010, taking them to fifth place; their best result since 2002. The Reds followed up their performance in 2011 by winning their first Super Rugby championship since 1995. Ewan spent his playing days as a prop, debuting against France in 1990 and winning the World Cup in 1991. He retired in 1997 and immediately took up coaching. He worked as an Australian selector and assistant coach between 2000 and 2003 under Rod MacQueen and Eddie Jones. As an assistant he was part of successful Tri-Nations, Bledisloe Cup and British Lions campaigns. 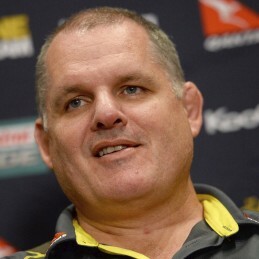 Ewen became the coach of the New South Wales Waratahs in late 2000, leading the team to the 2005 Super Rugby final in his second year and subsequent semi-finals in 2006 and 2008. He then went onto coach the Queensland Red’s to their first Super Rugby championship and the Wallabies. Unsure which keynote speaker will best suit your event? We excel at helping our clients identify the right speaker. Whether your occasion requires motivation from an industry leader, laughs and a chance for your staff to relax or the thrill of being in the same room as one of their heroes, we can connect you with the right speaker. We have an unrivalled International client list, and after being in operation for over ten years we have catered for all sorts of occasions. Our aim is make your event truly memorable. For more information on any of our speakers or the services International Speakers Group provide, enquire below. We look forward to hearing from you. We understand that your keynote speaker can make or break your event. We excel at helping our clients identify the right speaker, and from enquiry to your event day we handle all arrangements to ensure a smooth and successful presentation is delivered.